ANDOVER – Whether single or in a relationship, if you are looking for a way to celebrate Valentine’s Day this year you won’t want to miss Andover United Methodist Church’s fourth annual free Valentine’s Day dinner as scheduled for 6 p.m. on Sunday, Feb. 10 in Andover. (From Feb. 8 edition). According to Coordinator of the event Cindy Harvel, this year’s event will feature Revolutionary War Speaker Col. Suellyn Novak who will be offering a living history from her 32 years of service with the U.S. Air Force in which she developed a passion for U.S. History. “She will bring to life this particular era with uniform and artifacts,” said Harvel. In addition to the presentation Harvel said the evening will also include a romantic Italian dinner of lasagna, tossed salad, garlic bread and dessert being cooked by herself and her husband Rev. Ric Harvel, with the FUMC Tweens helping serve the dinner. Furthermore towards the end of the evening couples will also have the opportunity to renew their wedding vows as well. In regards to how the dinner first got started Harvel said came about through her and her husband after they first came up with the idea in 2016. Some of their past themes she said have included “A Karaoke Valentine,” which included a funny rendition of Sonny and Cher with Karl Betts and Kris Groff, “A Walk Down Memory Lane” featuring wedding gowns and pictures of the church family couples, “A Musical Valentine” with singer Josh Woodard as featured soloist, as well as “A Valentine Game Night” with game show panelists answering key questions. This year’s event Harvel said became established after she found out about Suellyn’s love of history and passion of sharing it with others as a member of the FUMC Choir with her husband Larry. Anyone interested in attending the Valentine’s Day dinner Harvel notes can be any age and does not have to be a member of the church but are encouraged to RSVP by Friday, Feb. 8 in order to accommodate for enough food for the event. For further information or to RSVP for the Valentine’s Day dinner event please call the church at (440) 293-6290. 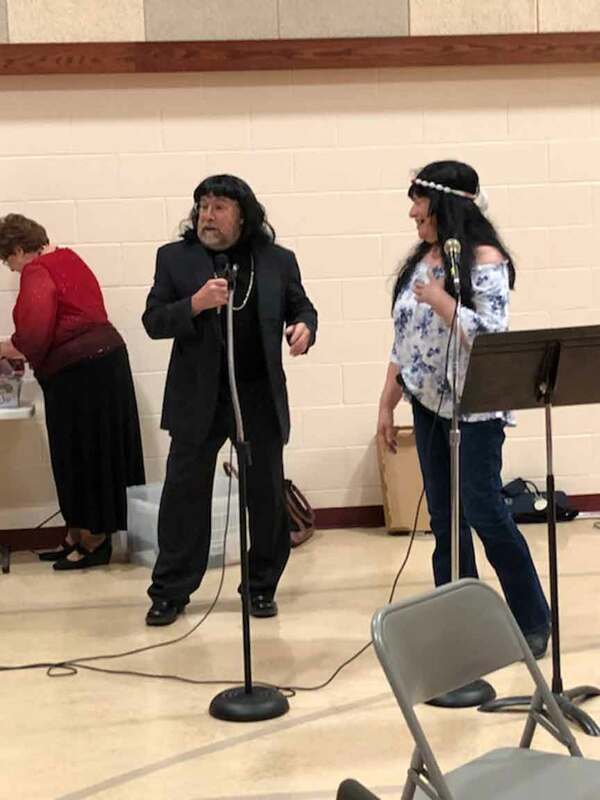 Pictured: Karl Betts and Kris Groff offering a funny rendition of Sonny and Cher’s “I’ve Got You Babe” during Andover United Methodist Church’s annual Valentine’s Day dinner of 2018. This year’s dinner is scheduled for Sunday, Feb. 10 and will offer Revolutionary War Speaker Col. Suellyn Novak.